It was the first time on American television that a situation comedy keyed in on the zany escapades of a Beatles-styled rock band. The type of stylized new-age cinematic techniques (ala A Hard Day's Night) were coupled with music from some of finest songwriters in America (Gerry Goffin/Carole King, David Gates, Neil Diamond, Barry Mann/Cynthia Weil). The terminally cute vocalist Davy Jones, guitarist Mike Nesmith, bassist Peter Tork and drummer Micky Dolenz catapulted songs such as "I'm A Believer," "(I'm Not Your) Steppin' Stone," "Daydream Believer," "Last Train To Clarksville" and "Pleasant Valley Sunday" into huge hits. 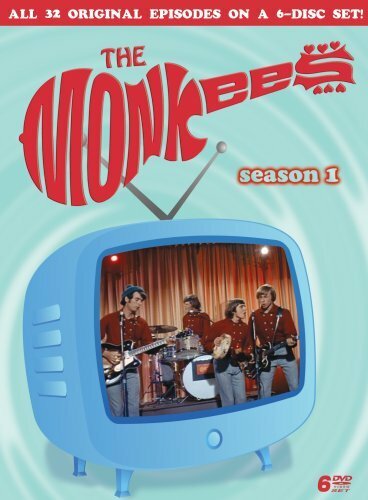 Bonus features for the first season include commentary from the band and the show's directors, trivia for each episode, a 16mm version of the original pilot, discography and vintage Monkees Kelloggs commercials. HEY HEY THEY'RE THE MONKEES! The 32 half-hour episodes of Season 1 , contained on six discs, originally aired in 1966. It was the first time on American television that a situation comedy keyed in on the zany escapades of a Beatles-styled rock band. The type of stylized new-age cinematic techniques (ala A Hard Day's Night) were coupled with music from some of finest songwriters in America (Gerry Goffin/Carole King, David Gates, Neil Diamond, Barry Mann/Cynthia Weil). The terminally cute vocalist Davy Jones, guitarist Mike Nesmith, bassist Peter Tork and drummer Micky Dolenz catapulted songs such as "I'm A Believer," "(I'm Not Your) Steppin' Stone," "Daydream Believer," "Last Train To Clarksville" and "Pleasant Valley Sunday" into huge hits. 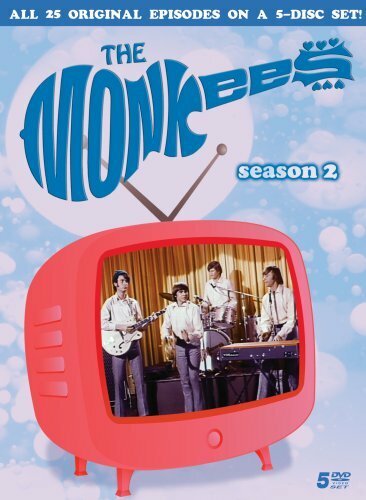 Bonus features for the first season include commentary from the band and the show's directors, trivia for each episode, a 16mm version of the original pilot, discography and vintage Monkees Kelloggs commercials. The 26 episodes of 1967's Emmy Award-winning Season 2 , spread out over five discs, contains bonus commentary, trivia and discography. One can see a maturation in musical style between the two seasons as Jones, Nesmith, Tork and Dolenz actually transform themselves into that which they, at first, portrayed as actors. Their innate comedic talents, coupled with their obvious musical ingenuity, makes both seasons a fascinating time capsule of the 1960s.